William F. Nolan (with George Clayton Johnson) penned the original novel Logan’s Run. Later, Nolan went on to write two sequels to Logan’s Run on his own. Born in Kansas City, Missouri, William F. Nolan was an mid-western boy who attended the Kansas City Art Institute and was an artist for Hallmark Cards. In the late 1940s, he moved to California where he studied at San Diego State College and began focusing on writing more than graphic arts. In 1952, he met Ray Bradbury, who influenced him to move to the Los Angeles area. Nolan joined a small group of writers there consisting of Ray Bradbury, Charles Beaumont and Richard Matheson, known as the “inner core” of the influential “Southern California Group”. By 1956, Nolan was a full-time writer. He has sold more than 1500 stories, articles, books and other works and is the winner of the Edgar Allan Poe Special Award from the Mystery Writers of America. What if you were not allowed to grow old? That the balance of resources in the world vs human population demanded that everyone die at the age of 21? This is the premise of Logan’s Run, an ageist future society where all children are implanted with crystal palmflowers at birth that shift in color as the child grows up. 0-6 the palm displays yellow. From 7-13 the flower crystal in your right palm would be blue. From 14-20 you would show the color red. On the day before your 21st birthday, your crystal would then oscillate between red and black and on your 21st birthday, it would turn completely black and you would be required to turn yourself in to a sleepshop where you would be put to death with a pleasure-inducing toxic gas. The story follows the life of Logan 3, a man who has a red crystal in his palm and is nearing his lastday. He is known as a Sandman, a man that tracks and hunts down runners. Runners are those that defy the social law of laying down their lives when their crystal goes black and attempt to find a refuge known only as Sanctuary. When the crystal in his palm begins to oscillate, Logan decides to use his lastday in order to infiltrate the runner underground and discover where Sanctuary is in order to destroy it. He asks for help from Jessica 6, a woman who he believes has contact with the underground. Only the oscillation of his palmflower convinces her to help him, even though he is a hated Sandman. Logan and Jessica are chased throughout the planet by Logan’s former friend, a Sandman named Francis. He discovers them when they finally make their way to the final staging area before departing for Sanctuary. Francis reveals a secret, that he is the man behind their escape named Ballard and that he is actually in his 40s. Ballard sends Logan and Jessica off-world to an abandoned space colony where Sanctuary actually exists and they can both grow old together in freedom. Like many people, I saw the movie Logan’s Run starring Michael York first before I read the book. In many respects, I liked the movie version a bit better. The people lived to be 30 years old, the “sleep” they were required to do had a religious element due to the participation of “Carousel” where the people were lifted into the air and then exploded. The people were told that the participants were “renewed” and became the young babies that were born later in the city. This made Logan’s doubt about the meaning of their society more believable. Yet, I found value in reading the original young adult dystopia novel from the 1960’s. The book is an obvious reaction to the youth movement of the 1960s when the battle cry was, “Don’t trust anyone over 30!” Many of the themes that now are commonplace in today’s science fiction were first seen in this novel. The book has not weathered time as well as other classic science fiction stories. A world “teetering on 6 billion” seems laughable when we live with a much larger population on the planet today without worry, and yet this is what science fiction is all about. Taking concerns of the current day and projecting them into the future to see what might happen and what solutions we could take…or not take, as the case may be. Unfortunately, there does not seem to be a digital version of this classic science fiction novel available today. You will need to find an old paperback of the trilogy in a used book store. I believe that Logan’s Run is worth picking up if you spot a book. Perhaps one day someone will digitize it so that we can access the story that inspired the famous science fiction movie. 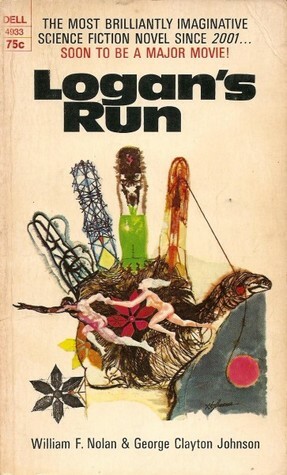 Logan’s Run is the first book of a trilogy. Next is Logan’s World and then Logan’s Search. Logan’s Run was made into a famous motion picture in 1976 starring Michael York and later into a network series for one season. In the 1990s it was made into a comic book series twice and now in the 2010s, it is being considered for a large scale movie remake. Nice review, I shall have to add it to my list!